Freedom to manifest one's religion or beliefs may be subject only to such limitations as are prescribed by law and are necessary to protect public safety, order, health or morals or the fundamental rights and freedoms of others. The Human Rights Committee has made extensive comments in its General Comment No. 22: The right to freedom of thought, conscience and religion. Headings and notes have been added here to sections of this Comment for ease of reading. 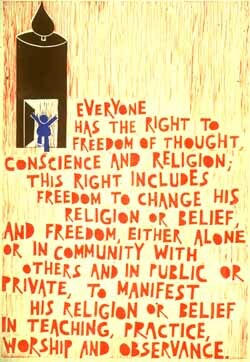 The right to freedom of thought, conscience and religion (which includes the freedom to hold beliefs) in article 18.1 is far-reaching and profound; it encompasses freedom of thought on all matters, personal conviction and the commitment to religion or belief, whether manifested individually or in community with others. The Committee draws the attention of States parties to the fact that the freedom of thought and the freedom of conscience are protected equally with the freedom of religion and belief. The fundamental character of these freedoms is also reflected in the fact that this provision cannot be derogated from, even in time of public emergency, as stated in article 4.2 of the Covenant. Article 18 protects theistic, non-theistic and atheistic beliefs, as well as the right not to profess any religion or belief. The terms "belief" and "religion" are to be broadly construed. Article 18 is not limited in its application to traditional religions or to religions and beliefs with institutional characteristics or practices analogous to those of traditional religions. The Committee therefore views with concern any tendency to discriminate against any religion or belief for any reason, including the fact that they are newly established, or represent religious minorities that may be the subject of hostility on the part of a predominant religious community. Article 18 distinguishes the freedom of thought, conscience, religion or belief from the freedom to manifest religion or belief. It does not permit any limitations whatsoever on the freedom of thought and conscience or on the freedom to have or adopt a religion or belief of one's choice. These freedoms are protected unconditionally, as is the right of everyone to hold opinions without interference in article 19.1. In accordance with articles 18.2 and 17, no one can be compelled to reveal his thoughts or adherence to a religion or belief. The freedom to manifest religion or belief may be exercised "either individually or in community with others and in public or private". The freedom to manifest religion or belief in worship, observance, practice and teaching encompasses a broad range of acts. The concept of worship extends to ritual and ceremonial acts giving direct expression to belief, as well as various practices integral to such acts, including the building of places of worship, the use of ritual formulae and objects, the display of symbols, and the observance of holidays and days of rest. The observance and practice of religion or belief may include not only ceremonial acts but also such customs as the observance of dietary regulations, the wearing of distinctive clothing or headcoverings, participation in rituals associated with certain stages of life, and the use of a particular language customarily spoken by a group. In addition, the practice and teaching of religion or belief includes acts integral to the conduct by religious groups of their basic affairs, such as the freedom to choose their religious leaders, priests and teachers, the freedom to establish seminaries or religious schools and the freedom to prepare and distribute religious texts or publications. The Committee observes that the freedom to "have or to adopt" a religion or belief necessarily entails the freedom to choose a religion or belief, including the right to replace one's current religion or belief with another or to adopt atheistic views, as well as the right to retain one's religion or belief. Article 18.2 bars coercion that would impair the right to have or adopt a religion or belief, including the use of threat of physical force or penal sanctions to compel believers or non-believers to adhere to their religious beliefs and congregations, to recant their religion or belief or to convert. Policies or practices having the same intention or effect, such as, for example, those restricting access to education, medical care, employment or the rights guaranteed by article 25 and other provisions of the Covenant, are similarly inconsistent with article 18.2. The same protection is enjoyed by holders of all beliefs of a non-religious nature. The Committee is of the view that article 18.4 permits public school instruction in subjects such as the general history of religions and ethics if it is given in a neutral and objective way. The liberty of parents or legal guardians to ensure that their children receive a religious and moral education in conformity with their own convictions, set forth in article 18.4, is related to the guarantees of the freedom to teach a religion or belief stated in article 18.1. The Committee notes that public education that includes instruction in a particular religion or belief is inconsistent with article 18.4 unless provision is made for non-discriminatory exemptions or alternatives that would accommodate the wishes of parents and guardians. In accordance with article 20, no manifestation of religion or belief may amount to propaganda for war or advocacy of national, racial or religious hatred that constitutes incitement to discrimination, hostility or violence. As stated by the Committee in its General Comment 11, States parties are under the obligation to enact laws to prohibit such acts. Article 18.3 permits restrictions on the freedom to manifest religion or belief only if limitations are prescribed by law and are necessary to protect public safety, order, health or morals, or the fundamental rights and freedoms of others. The freedom from coercion to have or to adopt a religion or belief and the liberty of parents and guardians to ensure religious and moral education cannot be restricted. In interpreting the scope of permissible limitation clauses, States parties should proceed from the need to protect the rights guaranteed under the Covenant, including the right to equality and non-discrimination on all grounds specified in articles 2, 3 and 26. Limitations imposed must be established by law and must not be applied in a manner that would vitiate the rights guaranteed in article 18. The Committee observes that paragraph 3 of article 18 is to be strictly interpreted: restrictions are not allowed on grounds not specified there, even if they would be allowed as restrictions to other rights protected in the Covenant, such as national security. Limitations may be applied only for those purposes for which they were prescribed and must be directly related and proportionate to the specific need on which they are predicated. Restrictions may not be imposed for discriminatory purposes or applied in a discriminatory manner. The Committee observes that the concept of morals derives from many social, philosophical and religious traditions; consequently, limitations on the freedom to manifest a religion or belief for the purpose of protecting morals must be based on principles not deriving exclusively from a single tradition. Persons already subject to certain legitimate constraints, such as prisoners, continue to enjoy their rights to manifest their religion or belief to the fullest extent compatible with the specific nature of the constraint. States parties' reports should provide information on the full scope and effects of limitations under article 18.3, both as a matter of law and of their application in specific circumstances. The fact that a religion is recognized as a state religion or that it is established as official or traditional or that its followers comprise the majority of the population, shall not result in any impairment of the enjoyment of any of the rights under the Covenant, including articles 18 and 27, nor in any discrimination against adherents to other religions or non-believers. In particular, certain measures discriminating against the latter, such as measures restricting eligibility for government service to members of the predominant religion or giving economic privileges to them or imposing special restrictions on the practice of other faiths, are not in accordance with the prohibition of discrimination based on religion or belief and the guarantee of equal protection under article 26. The measures contemplated by article 20, paragraph 2 of the Covenant constitute important safeguards against infringement of the rights of religious minorities and of other religious groups to exercise the rights guaranteed by articles 18 and 27, and against acts of violence or persecution directed towards those groups. The Committee wishes to be informed of measures taken by States parties concerned to protect the practices of all religions or beliefs from infringement and to protect their followers from discrimination. Similarly, information as to respect for the rights of religious minorities under article 27 is necessary for the Committee to assess the extent to which the right to freedom of thought, conscience, religion and belief has been implemented by States parties. States parties concerned should also include in their reports information relating to practices considered by their laws and jurisprudence to be punishable as blasphemous. If a set of beliefs is treated as official ideology in constitutions, statutes, proclamations of ruling parties, etc., or in actual practice, this shall not result in any impairment of the freedoms under article 18 or any other rights recognized under the Covenant nor in any discrimination against persons who do not accept the official ideology or who oppose it. Many individuals have claimed the right to refuse to perform military service (conscientious objection) on the basis that such right derives from their freedoms under article 18. In response to such claims, a growing number of States have in their laws exempted from compulsory military service citizens who genuinely hold religious or other beliefs that forbid the performance of military service and replaced it with alternative national service. The Covenant does not explicitly refer to a right to conscientious objection, but the Committee believes that such a right can be derived from article 18, inasmuch as the obligation to use lethal force may seriously conflict with the freedom of conscience and the right to manifest one's religion or belief. When this right is recognized by law or practice, there shall be no differentiation among conscientious objectors on the basis of the nature of their particular beliefs; likewise, there shall be no discrimination against conscientious objectors because they have failed to perform military service. The Committee invites States parties to report on the conditions under which persons can be exempted from military service on the basis of their rights under article 18 and on the nature and length of alternative national service. While there is some protection given to religious freedom in the Australian Constitution, it is far from comprehensive. Section 116 prohibits the Commonwealth Parliament from enacting legislation that would prohibit the free exercise of religion or establish a religion. This constitutional protection is, however, limited in a number of ways. It applies only to the Commonwealth and does not extend to legislative or other action by the States. It does not apply to all Commonwealth government action but only to legislation or actions taken under legislation. It does not, in its terms, protect beliefs that are not religious (although the High Court has interpreted it to extend to atheism and agnosticism at least). Interpretation of s116 by the High Court has in most respects been restrictive and limiting. Rejection of proposals for a Bill of Rights to give effect to Australia's obligations under the ICCPR, and of the proposal by the Commission for specific Religious Freedom legislation, means that there is no comprehensive Commonwealth legislation that protects religious freedom or prohibits discrimination on the basis of religion or belief. As discussed on our Common law rights and human rights scrutiny page, there are presumptions in statutory interpretation that Parliament did not intend to limit fundamental rights, and intended to legislate consistently with Australias's international obligations including under human rights treaties. As well as being included in Australia's international obligations through ICCPR Article 18, religious freedom has been recognised as among the common law rights covered by the common law presumption. The presumptions regarding common law rights and regarding consistency with Australia's international obligations are both, however subject to being dispaced by sufficiently clear words in legislation. posts which are irrelevant to the topic or are otherwise contrary to our social media guidelines may be deleted. Please email if any difficulties are encountered in posting comments.